The headline of our local paper’s Sunday edition was, “#Occupy The World: Wall Street Protests Go Global in Asia, Africa, Europe” and so the bold printing, coupled with the fact that he got a Sabbath’s leisurely day off, triggered the first time my working-in-the-trenches husband brought it up and into our conversation in any great detail. He was aware of the Occupy Wall Street protesting, but very off-handedly up to now, for he is more luddite in his habits, and prefers to keep it that way (he thought the # hashtag mark was a typo :). However current affairs are hard to ignore when tipping points happen — the “hundreds of thousands” participating in the grassroots Occupy Wall Street protest is quite a movement. We both hope it can remain peaceful as passions continue to flare. Our conversation got me thinking about those I think of as “my peeps” too — in the trenches managers who do try to be aware of everything going on with “the big picture” and in “a global world” today, but who are much closer to having my husband’s habits than having mine. They are managers who I wish I could talk to on blogs, on Twitter, or on LinkedIn, but they aren’t there. They are managers who I wish I could reblog and tag on Tumblr as a better collection of our voices, but they aren’t there either. They are in their trenches, working by their Ho‘ohana, and managing with Aloha too, but in a more hands-on way than I do as a manager/ writer/ coach/ having the luxury of more knowledge work than physical work, and choosing virtual teams and tribes in addition to my geographic ones. Work happens wherever you are, and whenever you decide you’ll do it. Work happens why you want it to, and why you need it to. Work also happens in whatever you feel is your logical progression for it to happen. More often than not, it’s according to a personal hierarchy of needs (like Maslow articulated for us), but that’s my convenient point of reference, and my habitual one, and others may not think about it at all. They stay in their trenches, and they ho‘omau; they persist. They concentrate on the work at hand. It’s the work of their own hand, and they concentrate on making it good. On making it both worthy (to the world) and worthwhile (to them). This is one of the up sides to Occupy Wall Street being a leaderless movement: Every single participant has a much greater freedom with defining what the best-case scenario of good followership is for them. Every single participant can be unencumbered, and can make a difference of some kind, so this very pervasive movement tips from frustration to worthy action. So when I think about all those “hundreds of thousands” participating in an ‘Occupy’ protest of some kind, my wish for them is the value alignment of Ho‘ohana — I hope the work they have presently chosen gets streamlined and focused in a very personal way for them, where it becomes a very clear intention for worthwhile work. This is one of those crucible times, where people can more clearly discern their purpose or calling. The Occupy Wall Street movement represents an amazing amount of human energy. It deserves the significance of Ho‘ohana. Related Reading in the archives: Following is NOT a Passive Activity. 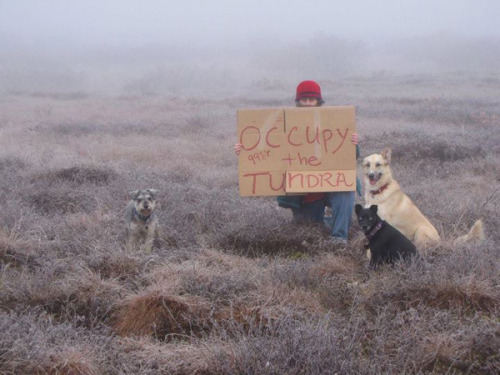 ‘Occupy the Tundra’: One woman’s lonely vigil in bush Alaska. Click on the photo for the story at the LA Times. The up side, is that when I get scared I just work harder, but with better focus on why I bother in the first place. If the children of your employees believe that working imprisons their parents and makes them grumpy people, it’s your fault. Hold yourself accountable for that, and fix it. Those children are going to grow up, and be our workforce one day: What attitude do we want them to bring to the workplace with them? I do what I do, and with the passion I have for it, because I was an exception to the rule and I know it. I was one of the truly lucky ones, not just lucky in the way Allison describes it above. What my parents illustrated for me, was that work was what they made it, and making it great was entirely possible. They did this in spite of the bosses they had, and they partnered with my teachers in demonstrating it for me. Well, I wanted to be a boss; I wanted to be a manager. I knew we could do better, and be better, and support parents like mine. This, is essentially how Managing with Aloha came to be: My dream, is that all managers become the teaching boss my dad never had, but taught me was possible. We work our way up what Maslow called our hierarchy of needs: We work for our basic sustenance to start, but hopefully we will progress, reach higher, and work our way through the other levels; through a sense of belonging, through self-esteem, and toward the stuff of self-actualization which makes legacy possible. Jobs are what we have to do in the economic machine of society. Work can be what we get to do in an inspired life (what we call the value of Ho‘ohana). We managers shape working culture. Managing with Aloha is a way we do that, and do it well. 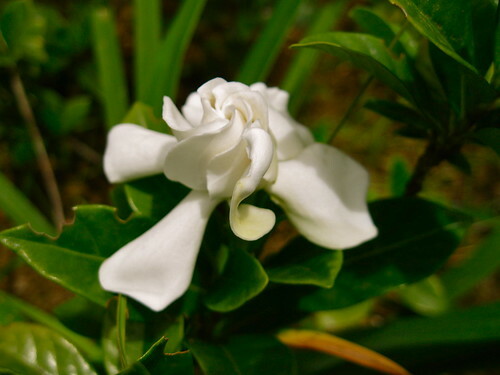 I believe it’s the best way, because to manage with the values rooted in Aloha, is to manage with your own humanity. For what’s a culture? It’s a group of people with a common set of values and beliefs. To “shape working culture” is to create an environment in the workplace which is ‘good’ in every definition of the word. Good is healthy, and good begets more good. The workplace environment is a contagion. It infects and thereby affects everything connected to it through the people within it: It affects their homes and their families, it affects the quality of their play and the rest in their sleep. It affects people individually and on a very personal level, and it thereby affects entire communities and their attitudes, whether that be their despair, or their sense of hope. Understand “the drill” and understand it well. You don’t get to be a manager, and a truly great person, unless that is who you choose to be. You don’t get to be a manager, and a truly great person, unless you work on it intentionally every single day. You don’t get to be a manager, and a truly great person, unless you accept personal accountability for The Manager’s Kuleana, and can look into a child’s face and feel Pono, your rightness in our world. On that pyramid, that hierarchy of human needs, I see rightness above Sense of Belonging and before you get to Self-Actualization: Rightness is personal, and it’s right there where Maslow put Self-Esteem. We may have a long way to go before we get to Sense of Belonging for everyone. We continue to work our way there, knowing we have to: Quitting, or opting out, are not included in our viable options. However Sense of Belonging doesn’t cut it; it’s not enough.